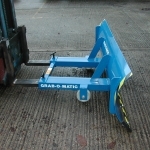 The Grab-O-Matic SC4 Snow Plough/Grader has a 180cm wide steel blade with a fixed left sweep and durable heavy duty reversible rubber wear strip. 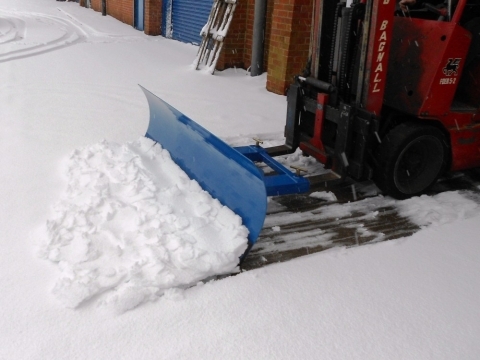 The SC4 can very quickly plough a snow free area to allow your business to funtion normally in adverse weather conditions. 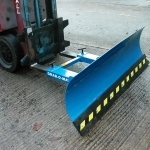 The SC4 can be quickly and easily attached to the forks of a fork truck or other equipmemt such as a ‘Bobcat’ or JCB etc that has a set of forks. St Clare Engineering are now also able to offer conversion kits for various types of tractor fittings. 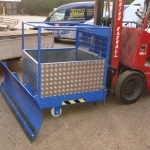 The SC4 is available in 180cm or 120cm blade widths and can also be used as a general purpose grader for moving sand, soil, shingle etc. 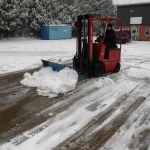 When used in conjunction with the Towable Salt Spreader the SC4 can clear a path in the snow and lay salt/grit at the same time. Attached to the forks with T-bolts. Wheels keep the unit level. The SC4 is angled left to clear a path through the snow. There is a reversible and replaceable rubber blade. Specially designed for carrying tools.